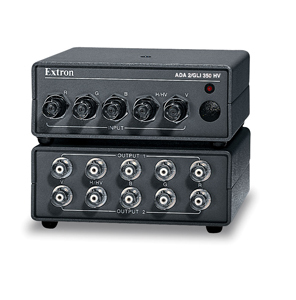 The Extron ADA 2/GLI 350 HV is a one input, two output RGB and sync analog distribution amplifier with a built-in GLI 350 ground loop isolator. The ADA 2/GLI 350 HV is compatible with any computer source that runs RGsB, RGBS, and RGBHV. The ADA 2/GLI 350 HV has a 350 MHz (-3 dB) RGB video bandwidth and two buffered outputs for connecting a personal computer or a high resolution BNC output workstation to two compatible data or graphic projectors or monitors with BNC inputs. The ADA 2/GLI 350 HV can also connect to system switchers for preview monitoring.